If Photo Kano is all the creepy picture taking you could ever want, then you're going to need a new Memory Stick. Good thing Sony is releasing just that! 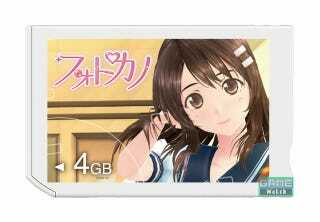 Going on sale September 29, the Photo Kano 4GB Memory Stick is priced at ¥3,280 (US$40). It comes with a redeemable code for Photo Kano PSP wallpaper. Photo Kano is kind of like Pokémon Snap meets schoolgirls.